PA State Rep. Tom Mehaffie - Merry Christmas & Happy New Year! Linda and I send our best wishes to you and your family for a wonderful Christmas season filled with happiness, fun and an abundant year ahead! House OKs State Budget Reforms, Spending Control Measures…In ongoing efforts to stand up for taxpayers, the House this week approved historic legislation to change budget-making in Harrisburg by bringing integrity, transparency and spending limits to the state budget and budget process. The legislative package – House Bills 1940-1945 – requires transparency through an official estimate of how much money the state will have, more information about the balances in taxpayer-supported special funds used to provide grants and subsidies, and the creation of monetary reserves during revenue shortfalls. Additionally, a proposed state constitutional amendment to limit state spending, House Bill 110, would impose a cap based on recent increases in the Consumer Price Index and state population growth. A constitutional amendment must be approved in two consecutive legislative sessions and then by the state’s voters. These measures, which are now headed to the Senate, are in addition to a new state law requiring performance-based budgeting. This information will help legislators decide which programs to fund. Children’s Health Insurance Program Extension…To help ensure coverage of the popular and successful Children’s Health Insurance Program (CHIP), legislation is currently on the governor’s desk to extend the program for two more years. For 25 years, CHIP has provided insurance coverage to uninsured children and teens (up to age 19) whose families earn too much to qualify for Medical Assistance, but who cannot afford to purchase private insurance. CHIP is supported by both state and federal funds and provides payment for health care coverage for eligible children who meet income and other criteria. More than 180,000 children are currently enrolled in CHIP. More information about CHIP is available online at www.CHIPCoversPAKids.com. 106th District Company Awarded Grant for Workforce Development… Congratulations to Phoenix Contact Inc., a Lower Swatara Township-based company specializing in industrial connection technology, automation technology, electronic interface systems and surge protection. The company received a $60,000 grant from WEDnetPA to assist with workforce development for its employees. Focused mainly on the manufacturing and technology industries, WEDnetPA offers two types of training assistance to employees to help strengthen the business environment in Pennsylvania. The programs include essential skills training and advanced technology training, which provides instruction in high-tech and advanced manufacturing subjects. Funding is provided by the Pennsylvania Department of Community and Economic Development through the PA First fund, which focuses on increased investment and job creation within the Commonwealth. Jan. 2…Senior citizens are reminded that the new deadline to apply for the state’s 2016 Property Tax/Rent Rebate program is Jan. 2, 2018. Applications are available from my district office or municipal offices and libraries throughout the 106th District. Eligible participants can receive a rebate of up to $650 based on their rent or property taxes paid in 2016. The program benefits eligible Pennsylvanians who are 65 years or older, widows and widowers 50 years or older, and those 18 years or older with disabilities. For complete eligibility guidelines, click here. Applicants should be prepared to provide all the necessary income, property tax or rental information required to process claims quickly and accurately. Claimants who already applied for their rebates may check the status of claims online at www.revenue.pa.gov or by calling, toll-free, 1-888-PATAXES. Applications for the 2017 program are expected to be available in early February. A huge “thank you” to our beloved mayor and renowned local chef, Brad Miller, who will be retiring at the end of his term after 12 years of service to the Hummelstown community. 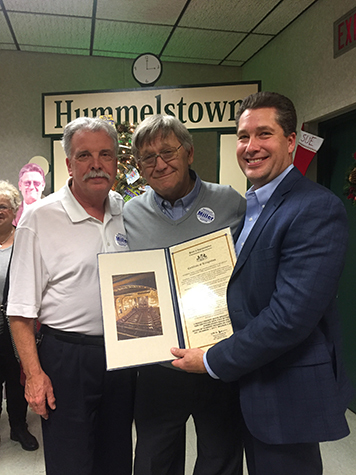 Mayor Miller has been the face and spirit of this borough for many many years, and we are grateful for his and his wife, Barbara Miller’s dedication and personal commitment to making Hummelstown a better place to live and work. It was an honor for me and John to present the mayor with a certificate of recognition during his farewell celebration. I had Breakfast with Santa at The Middletown Home this year. It was wonderful to see the excitement on all the kids’ faces. What a great event put together by the folks at Middletown Home. 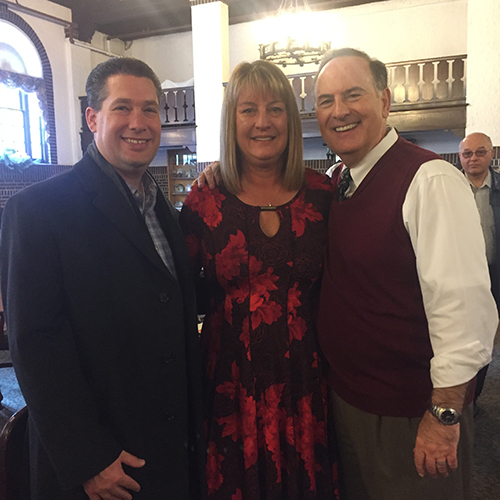 In the top photo, I’m pictured with Lou Vogel, CEO of The Middletown Home and Andrea Henney, the director of marketing. 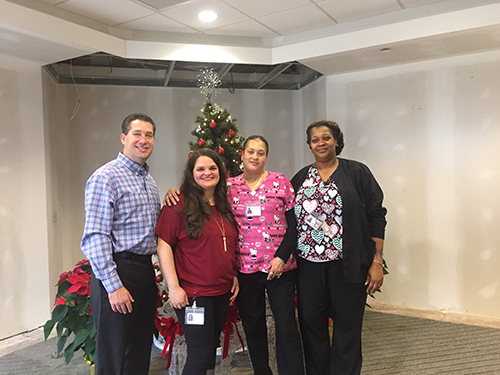 In the bottom photo, I’m pictured with some of the caring staff that make this home a wonderful place: Madelin Gamble, Aisha Shank and Lisa Roberts. I recently held a luncheon meeting with Central Dauphin, Lower Dauphin, Derry Township, Dauphin County Technical and Middletown superintendents and school board presidents to discuss various issues impacting our public schools. 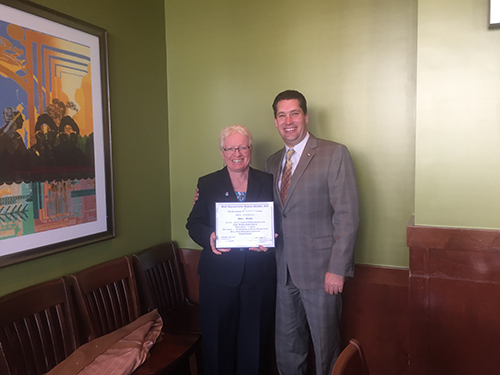 During the event, I presented Lower Dauphin School District Superintendent Dr. Sherri Smith with a retirement certificate honoring her 15 years of service as superintendent to Lower Dauphin. Dr. Smith will be greatly missed by the LD community! I met with members of the Santoni-Dininni VFW Post No. 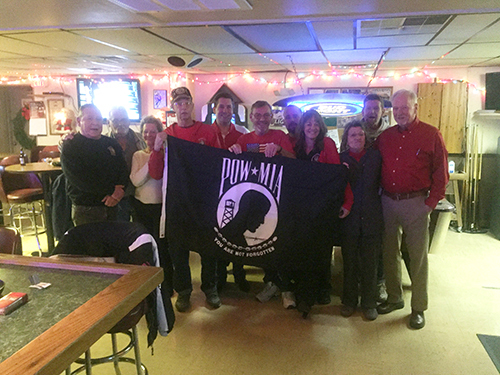 1213 in Rutherford and presented them with a POW/MIA flag and U.S. flag for the post. Commander Pat Morrow (center) and his crew were honoring our troops on “Red Shirt Friday.” Thank you all for your service and for everything you do for our communities!